It is already known that aside of as a center of dragon fruit producer, Banyuwangi was also known as the biggest orange producer in east java. Siam Orange from Banyuwangi has penetrated the national market. However, when its prices go down because of market overload or because of many of the oranges are broken because of its picking process, the orange will be dumped by the people. Therefore to increase its value, through community participation toward the independent and prosperous community in Tegalsari, its required to process those Siam oranges into another creative product such as cake, LADRANG, and Orange jelly, so its process can produce healthy and durable food. Some approaches had been made by observing community habit of processing the broken Siam orange, finally through the participation of mums and the member of PKK from Dusun Krajan Tegalsari, the processing Siam orange into orange cake can be done and produce the cake that healthy and full of vitamins and this process can increase the income of the community in Tegalsari. SYAFAAT, Abdul Kholiq; MUBAROK, Nafi; AZIZ, Abdul. Mengolah Limbah Jeruk Menjadi Olahan Kreatif (Aksi Partisipatori Menuju Masyarakat Yang Mandiri Dan Sejahtera di Desa Tegalsari Kecamatan Tegalsari Kabupaten Banyuwangi). 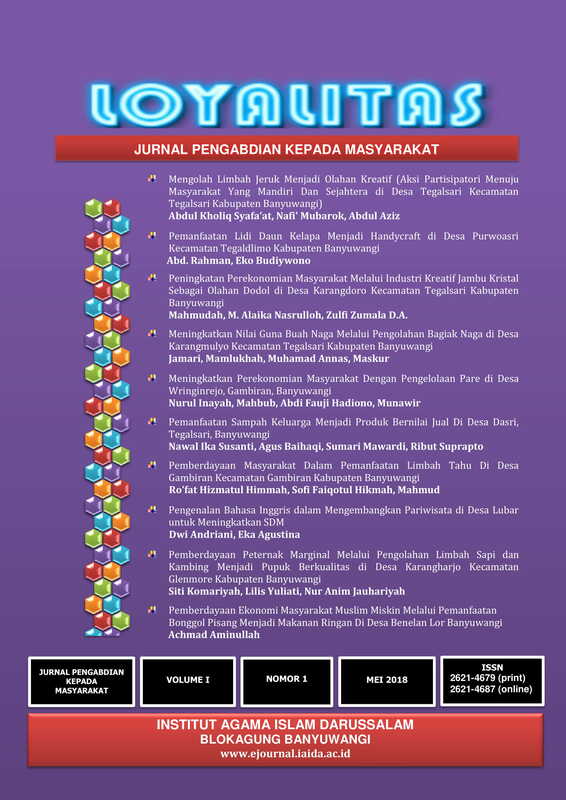 LOYALITAS, Jurnal Pengabdian Kepada Masyarakat, [S.l. ], v. 1, n. 1, p. 1-10, may 2018. ISSN 2621-4687. Available at: <http://ejournal.iaida.ac.id/index.php/loyal/article/view/306>. Date accessed: 26 apr. 2019.